Krishna Dvaipâyana Vyâsadeva (lit. : 'the compiler, the godhead who assembled the verses' and also called Bâdarâyana or Veda Vyâsa) is an important and much revered figure in the Hindu tradition and its literature. He is considered to be an ideal Brahmarishi - omniscient, truthful, purest of the pure and possessor of knowledge of the essence of Brahman. Vyâsa appears for the first time as the author and an important character in the hindu epic Mahâbhârata. The epic, whilst having its roots in historical events centuries before the common era, is an extraordinarily long compendium of legend, myth, philosophy and semi-historical material about ancient India. It is impossible to point out when the 'historical' Vyâsa lived or disentangle a factual story from the legendary material contained in the epic. According to the Mahâbhârata, he was the son of Satyavatî, a ferryman's (mukkuvan) daughter, and the wandering sage Parâs'ara Muni. He was born on an island in the river Yamunâ. The place is near a town Kalpi in Jaluan district in Uttar Pradesh. He was dark in colour and hence was named Krishna; as he was born on an island (Sanskrit dvîpa), he was also called Dvaipâyana. Thus he is generally known as Krishna Dvaipâyana. The child grew up to be an adult as soon as he was born; adopting the life of an ascetic, he soon became one of the greatest rishis (sages). In the Purânas, especially the Vishnu Purâna and Bhâgavata Purâna (S'rîmad Bhâgavatam), he is considered an incarnation (Avatâra of Vishnu). Vyâsa is considered to be one of the seven Chiranjeevin immortals in Hindu mythology. It is traditionally held by Hindus that the sage classified the primordial single Veda into four. Hence he was called Veda Vyâsa, or Splitter of the Vedas; the splitting being a feat that allowed mortals to understand the divine knowledge of the Veda. The word vyâsa means split, differentiate, or describe. This title is the most popular way of referring to him. In every third world age (Dvapara), Vishnu, in the person of Vyâsa, in order to promote the good of mankind, divides the Veda, which is properly but one, into many portions. Observing the limited perseverance, energy, and application of mortals, he makes the Veda four-fold, to adapt it to their capacities; and the bodily form which he assumes, in order to effect that classification, is known by the name of Veda-vyâsa. Of the different Vyâsas in the present Manvantara and the branches which they have taught, you shall have an account. Twenty-eight times have the Vedas been arranged by the great Rishis in the Vaivasvata Manvantara... and consequently eight and twenty Vyâsas have passed away; by whom, in the respective periods, the Veda has been divided into four. The first... distribution was made by Svayambhu (Brahmâ) himself; in the second, the arranger of the Veda (Vyâsa) was Prajâpati... (and so on up to twenty-eight). Vyâsa is traditionally known as author of this epic. But he also features as an important character in it. His mother later married the king of Hastinapura, and had two sons. Both sons died without an issue and taking recourse to an ancient practice called Niyoga where a chosen man can father sons with the widow of a person who dies issueless, she requests Vyâsa to produce sons on behalf of her dead son Vichitravirya. Vyasa fathers the princes Dhritarashtra and Pându (by Ambika and Ambalika, the wives of dead king. The sequence of events also leads to a third son, Vidura, by a serving maid to the queens. While these are 'legally' not his sons, another son S'ukadeva (S'uka), born of a celestial nymph, is considered his true spiritual heir. He thus was the grandfather of both the warring parties of the Mahâbhârata, the Kauravas and the Pândavas. He makes occasional appearances in the story as a spiritual guide to the young princes. In the first book the Mahâbhârata, and is said that he asked Ganesha to aid him in writing it down. It is said that Ganesha imposed a condition that Vyâsa narrate the story without pause, and Vyâsa made a counter-condition that Lord Ganesh understand the verse before he transcribed it. This is supposed to explain the complicated Sanskrit used in some sections of the Mahâbhârata, recited by Vyâsa when he wanted a break. In addition to the epic, he is also credited with the writing of the eighteen major, if not all Purânas. His son S'uka is the narrator of the major Purâna Bhâgavata Purâna. Vyâsa appears as Kanha-dipayana (the Pali version of his name) in two Jataka tales: the Kanha-dipayana Jataka and Ghata Jataka. Whilst the former in which he appears as the Bodisattva has no relation to his tales from the Hindu works, his role in the latter one has parallels in an important event in the Mahâbhârata. The important Bhagavata-Purana(Chapter 11) narrates: The sages Visvâmitra, Asita, Kanva, Durvâsâ, Bhrigu, Angirâ, Kas'yapa, Vâmadeva, Atri, Vasishthha, along with Nârada and others, (once) stayed in the house of the lord of the Yadus (Krishna)...The young boys of the Yadu dynasty playing (there) approached them with Sâmba the son of Jâmbavati dressed up in woman's clothes. Taking hold of their feet they, feigning humility, impudently asked: 'This black-eyed pregnant woman wishing for a son, o learned ones, too embarrassed to ask it herself, is asking you whether you, with your vision never clouded, can tell if she'll give birth to a son or not?' The sages thus tricked said angered to the boys, o King: 'For you, o fools, she'll give birth to a mace which will destroy the dynasty! (see also S.B. 11.1). The Ghata Jataka has a different spin on it: The Vrishnis, wishing to test Kanha-dipayana's powers of clairvoyance, played a practical joke on him. They tied a pillow to the belly of a young lad, and dressing him up as a woman, took him to the ascetic and asked when the baby would be born. The ascetic replied that on the seventh day the person before him would give birth to a knot of acacia wood which would destroy the race of Vasudeva. The youths thereupon fell on him and killed him, but his prophecy came true . Notably, he is not the Bodhisattva in the Ghata Jataka. This reference matches the Jataka version and has lead some scholars to speculate that in the older versions Vyasa died in this attack, though the Arthashastra is actually speaking about the destruction of the attackers. The Brahma-Sutra is attributed to Bâdarâyana, which makes him the proponent of the crest-jewel school of Hindu philosophy, i.e., Vedanta?. As the island on which Vyâsa was born is said to have been covered by Badara (Indian jujube) trees, he is known as Bâdarâyana. Though traditionally, Vyâsa is considered the Bâdarâyana who wrote the Sutras, many historians think these were two different personalities. This text is a commentary on the Yoga Sûtras of Patañjali. Vyâsa is credited with this work also, though this is impossible, if Vyâsa's immortality is not considered, as it is a later text. Vyasa authored only the core of Mahabharata? consisting of 25,000 stanzas. He gave the name Jaya to his work. It later grew to 100,000 stanzas, probably due to the contribution of many authors including Vyasa's disciples like Vaisampayana?, Jaimini, Paila and Suka. Now it assumed the name Bharata. In the final phase, the epic grew to more than 150,000 stanzas. This was due to a few generations of authors like Ugrasrava Sauti?, contributing to it anonymously, attributing their contribution to Vyasa. In this final phase it was called the Mahabharata. Vyasa's Jaya, the core of Mahabharata is structured in the form of a dialogue between Dhritarashtra? (the Kuru king and the father of the Kauravas?, who opposed the Pandavas? in the Kurukshetra War?) and Sanjaya? his minister and well-wisher. Sanjaya narrates each incident of the Kurukshetra War, fought in 18 days, as and when it happened. Dhritarashtra sometimes asks questions and doubts and sometimes laments, knowing about the destruction caused by the war, to his sons, friends and kinsmen. He also feels guilty, due to his own role, that lead to this war, destructive to the entire Indian Subcontinent. In the beginning Sanjaya gives a description of the various continents of the Earth, the other planets, and focuses on the Indian Subcontinent and gives an elaborate list of hundreds of kingdoms, tribes, provinces, cities, towns, villages, rivers, mountains, forests etc of the (ancient) Indian Subcontinent (Bharata Varsha). He also explains about the military formations adopted by each side on each day, the death of each hero and the details of each war-racings. Some 18 chapters of Vyasa's Jaya constitutes the Bhagavat Gita?, the sacred text or Bible of the Hindus?. Thus, this work of Vyasa, called Jaya deals with diverse subjects like geography, history, warfare, religion and morality. The growth of Jaya into Bharata, was probably the work of Vyasa's disciple Vaisampayana?, along with many unknown authors. It is structured as a narration of the history of kings of the Bharata dynasty by Vaisampayana to Janamejaya? the grand-grandson of the Pandava?, Arjuna?. Jaya is embedded within it ! The final phase of Vyasa's work culminated as Mahabharata, structured as a narration by Ugrasrava Sauti?, who was a professional story teller, to an assembly of sages like Saunaka?. Bharata is embedded inside it, and within it Jaya ! Within Mahabharata is contained a legend in which Vyasa wishes to write down or inscribe his work. The Grandsire Brahma (creator of the universe) comes and tells Vyasa to get the help of Ganapati for his task. Ganapati writes down the stanzas recited by Vyasa from memory and thus the Mahabharata is inscribed or written. Ganapati could not cope up with Vyasa's speed and he misses many words or even stanzas. Who was Ganapati who wrote down Mahabharata ? The difficulty faced by Ganapati in writing down Mahabharata as described in the myth, could be real, and was most probably faced by those people who first attempted to write it down as some reciter recited it continuously. This is because, the reciter, will not be able to stop the recitation, in the middle and resume it, as the lines are committed to his memory as a continuous recording ! The name Ganapati, was used in ancient days, to denote the head of a republic. In ancient India, there were kingdoms ruled by kings or Rajas as well as republics ruled by elected heads or Ganapatis. Kambojas? were a republic. To some extend Dwaraka? had republican style of rule. Ganapati who wrote down Mahabharata, probably was one this republic chiefs, well educated in the art of writing or inscription. The usage of the name Ganapati and Ganesha to the elephant-god Ganesha? of Hindus?, could be a later phenomenon. Mahabharata was not the only work of Vyasa. He was a great Vedic scholar. He introduced the system of studying Vedas? in four ways. The Rig Vedic System, focused on the knowledge aspects of the Vedic Hymns. Yajur Vedic System focused on the practical application of the Vedic hymns in the context of a Vedic ritual. Sama Vedic System focused on the recitational aspects of the Vedic Hymns, converting thems to songs, and attributing musical properties to them. Atharva Vedic System focuses on the Vedic hymns that deal with the physical aspects of human life, like human health and well being. Later these four system of Vedic studies, newly introduced by Vyasa, and experimented among his disciples, became very popular. People began to study Vedas in one among the four ways. In later period the Vedas, studied in these four different ways began to get refined independent of each other. Thus Vyasa became known as the divider of Vedas, who divided the Vedas into four parts. The name Vyasa means divider or distributer, in Sanskrit. The 18 Puranas? were attributed to be authored by Vyasa. However it seems that he played a direct role in the authering of only one of them viz the Bhagavata Purana?, the largest among the Puranas. It deals with the life of Vasudeva Krishan?, who lived contemporary to Vyasa. 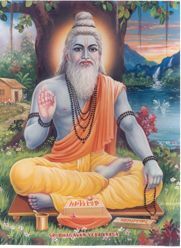 Sage Vyasa was highly influenced by the personality of Vasudeva Krishna, who was similar to him in many ways. Both were born in middle class, low status families. (Vasudeva Krishna among the Yadavas, who tended cattle and later rose to the status of Kshatriyas or vice versa, and Veda Vyasa among the fishermen community.) Both were dark skinned. Both were well versed in Vedas and champions of Vedic way of life. Apart from this Veda Vyasa was a sage and Vasudeva Krishna, a warrior. Though Vasudeva Krishna was a warrior, an excellent charioteer and a statesman externally, he was a sage and a teacher from within. This traits attracted Veda Vyasa and prompted him to author history of Vasudeva Krishna. It was added as a supplement to Mahabharata with the name Harivamsa? and later seeded the Mahabhagavata? Purana?. Vyâsa was born to Satyavatî, a member of the fishermen community, before her marriage with the kuru king Santanu. Vyâsa's father was a brahmin, by the name Parâsara, a sage in the lineage of Vasishthha Muni. Vyâsa was closely related to the Kauravas and Pândavas, so much as that he perpetuated their race in the line of the Kuru king Vicitravîrya and was the grandfather of the Pândavas and Kauravas. This kinship enabled him to know much about the happenings in the royal family, ultimately enabling him to author their history in the form of Jaya. He lived in Kurukshetra, in a forest, very near to the battlefield, enabling him to know considerable details about the Kurukshetra war, as it took place in front of his eyes. Historic Figures of Ancient India? Vyâsa- The present wikipedia page about Vyâsa. S'rîla Vyâsadeva, by S'rî Nandanandana dasa.